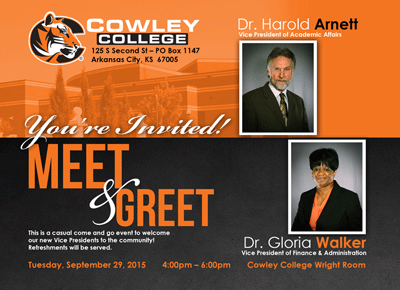 Members of the community are invited to meet Cowley College’s newly hired vice president of finance and administration and vice president of academic affairs during a Vice President’s Reception planned from 4-6 p.m. Tuesday, September 29 in the Earle N. Wright Community Room. Dr. Gloria Walker was hired as the vice president of finance and administration, while Dr. Harold Arnett was hired as the school’s vice president of academic affairs. Both Dr. Walker and Dr. Arnett began their new positions on September 1, 2015. Together, Dr. Walker and Dr. Arnett have more than 50 years of experience in higher education. Dr. Walker earned the Doctor of Education at Northeastern University with a concentration in Higher Education Administration. Prior to pursuing a doctoral degree, Dr. Walker served over 20 years in senior to executive level management in higher education. Over the course of her career in the areas of fiscal affairs; accounting and financial operations, Dr. Walker developed a solid background in community college administration at Houston Community College and South Florida Community College as (Executive) Vice Chancellor Finance and Administration and Vice President for Financial Services, respectively and Chief Financial Officer; and at Midland College, Midland, Texas in a similar capacity. Dr. Walker served as Executive Vice President and Chief Operating Officer at Texas Southern University for three years. Dr. Walker most recently served as the Vice President/Consultant for ASBSI, a Houston firm that specializes in financial advisory services for private, public, and governmental entities; and higher education institutions. Over the past 10 years, Dr. Walker has become an expert in performance-based budgeting in higher education. She has served as a member of the CEO’s executive team, and the Acting Chancellor. Dr. Walker has received numerous awards during her time in higher education. Dr. Walker has a Bachelor’s of Business Administration in Accounting from the University of Houston, and a Master’s Business Administration in Finance from the University of St. Thomas. Dr. Walker is also a Certified Public Accountant. In addition to Dr. Walker’s career, she has been married for 34 years to George Walker. The couple have two children, Lauren 29, and Jordan 25. Dr. Arnett earned an Associate’s degree in Education at Freed-Hardeman College (TN) in 1973, Bachelors and Masters degrees in Industrial Education at Murray State (KY) University in 1977 and 1982, and a PhD in Educational Theory & Practice at Ohio State University in 1988. After teaching high school Industrial arts from 1977-1984, Dr. Arnett was an Associate Professor of Education at Missouri Western State College (now University) from 1987-1994. He then completed a post-doctorate residency at the University of Kentucky from 1994-1995, was a (English, Geography and Life Skills) instructor for one year and then principal of Scott County Alternative School (Georgetown, KY) from 1995-2002. From 2004-2008, he served as Developmental Education Specialist at Highland Community College (KS) and then from 2008-2015 as Director of Institutional Research. He received the Outstanding Industrial Education Teacher in Kentucky award in 1982, was the recipient of the National Association for Industrial Education Outstanding Graduate Student Scholarship in 1986, and was the Jessie L. Meyers Excellence in Teaching Award recipient at Missouri Western in 1994. He also worked with other key individuals at Highland in setting up and conducting pilot programs that improved academic performance and persistence. Dr. Arnett and his wife, Randa Lynne Burleson, have been married for 26 years. The couple have nine grown children. Christy Baldwin Reed (St. Joseph, MO), MAJ. Michael Arnett (Key West), Angela Baldwin (deceased), CPT. Samuel Arnett (Ft. Leavenworth), Jaylon Baldwin (St. Joseph, MO), Daniel Arnett (Murray, KY), Benjamin Arnett (Houston, TX), Susan Arnett Parker (Paris, KY), and SSgt. Jeremiah Arnett (Afghanistan). Three of the couple’s sons are on active duty in the military. All totaled, Dr. Arnett and his wife, Randa, have 22 grandchildren. While working on his PhD through Ohio State University, Dr. Arnett took several creative writing courses. In addition to a fair number of professional publications, he has also had several poems, essays and articles appear in print. His first book of poetry was recently published by Amazing Things Press.